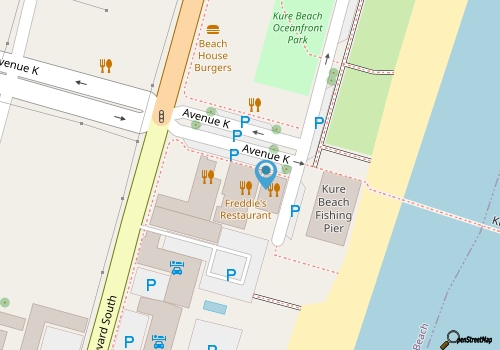 Visitors will find a surprising addition to the classic beach shops, bars, and restaurants that hug the Kure Beach oceanfront in the form of Freddie’s Restaurant. Easy to identify, thanks to a lemon yellow exterior and classic red, white and green clapboard awing, this close-to-shore Italian restaurant allows beach-goers to take a break from the sun, and chow down on a full array of Italian specialties. Despite its location that’s just a shell’s throw from the shoreline, the interior of Freddie’s feels like a welcoming Italian home, with classic checkered tablecloths and an array of booths and tables that are lined with murals and Italian décor. The menu is just as comforting and welcoming, with a full range of big specialties that include classic pasta dishes, lamb dishes, veal dishes, steak, seafood and chicken dishes, and veritably everything in between. Newcomers will have a hard time deciding what to order, so go for a classic like the famous four-layer lasagna, the Italian gumbo with sausage, shrimp, chicken and Cajun cream sauce, or “Freddie’s Special Spaghetti,” which is loaded with peppers, onions, and mushrooms, and is served with an Italian sausage and meatball. Wholly delicious and undeniably filling, Freddie’s Restaurant is a hearty way to cap off a day at the beach. Call (910) 458-5979 for current hours.